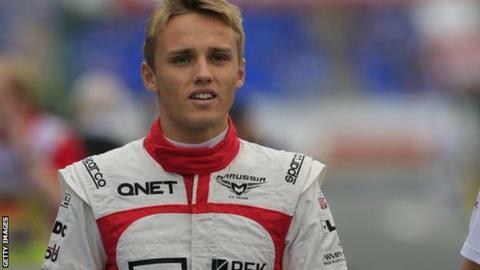 Max Chilton has been replaced at Marussia by reserve driver Alexander Rossi for this weekend's Belgian Grand Prix at Spa-Francorchamps. The team cited unspecified "contractual issues" for the decision. But the 23-year-old Briton's management said he had voluntarily stepped aside to allow the team to "attract much-needed funds by selling his seat". Chilton's statement said he would "attend the race and be on hand to support the team in any way possible". It added: "Marussia are currently in talks with several new investors and it is expected the situation will be resolved before the next race in Monza." Chilton has driven for Marussia since the start of the 2013 season and provides the team with funds in return for his drive. Marussia, who are currently ninth in the constructors' championship with two points, refused to comment on rumours that there had been a delay in payments due to the team from Chilton. Team boss John Booth said: "It was not our intention to offer Alexander the possibility to race this season. But in light of the circumstances, we are pleased to give him the opportunity to make his grand prix debut this weekend." Rossi, 22, said he was "thrilled", adding: "It's a very big moment for me and there's a lot to prepare in a short space of time, but on the other hand I have felt ready for this for quite a while now. "It is also exciting to be given this opportunity at such a fantastic and historical circuit as Spa-Francorchamps. "I can't wait to drive the MR03 from tomorrow and I hope to reward the team with a solid race weekend."